The recent GeoCurrents news post on electronics factories in Tierra del Fuego brought up the issue of a politically divided island. 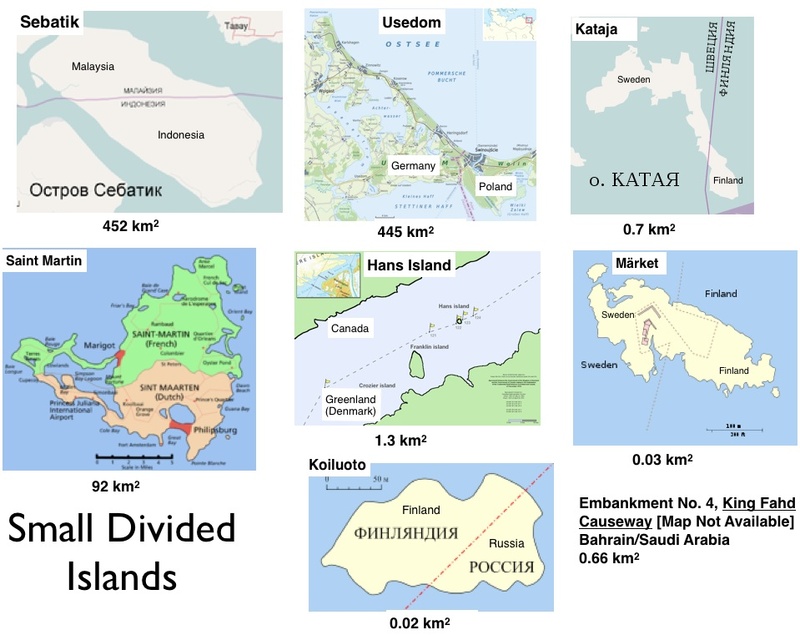 I did a quick mental count and came up with eight examples of such islands: New Guinea, Borneo, Ireland, Hispaniola, Timor, Cyprus, Saint Martin, and Tierra del Fuego (or, more properly, Isla Grande de Tierra del Fuego, to differentiate it from the archipelago of the same name.). The Wikipedia, however, lists seven other divided “sea islands,” as well as numerous divided lake and river islands. 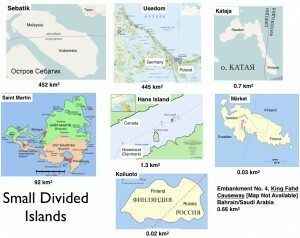 I had never heard of any of the other divided sea islands, although two are significantly larger than Saint Martin. I have provided maps of all these islands except Embankment No. 4 on the King Fahd Causeway, split between Bahrain and Saudi Arabia, which I was unable to locate. 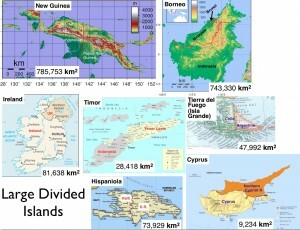 Indonesia has territory on more divided islands than any other country: New Guinea, Borneo, Timor, and Sebatik. At first glance, Borneo seems to be the most complexly divided island, as it contains major portions of two countries, Indonesia and Malaysia, as well as the entire extent of another, Brunei. The division of Cyprus, however, is more intricate. Cyprus contains two de facto countries, Cyprus and the Northern Cypriot Republic, although the international community largely rejects the legitimacy of the latter state. But Cyprus is further split by the existence of two sovereign British military bases, as well as a U.N. “buffer strip” that separates the two independent countries. The bulk of the territory of several internationally recognized countries is situated on divided islands: Papua New Guinea, Republic of Ireland, Brunei, Timor Leste, Haiti, Dominican Republic, and Cyprus. The Dutch half of Saint Martin (Sint Maarten) is also counted as a country, but not an independent one; rather, is forms a “constituent country of the Kingdom of the Netherlands.” The only island that is divided into two countries both of whose territories are largely limited to that island is Hispaniola, split between Haiti and the Dominican Republic.